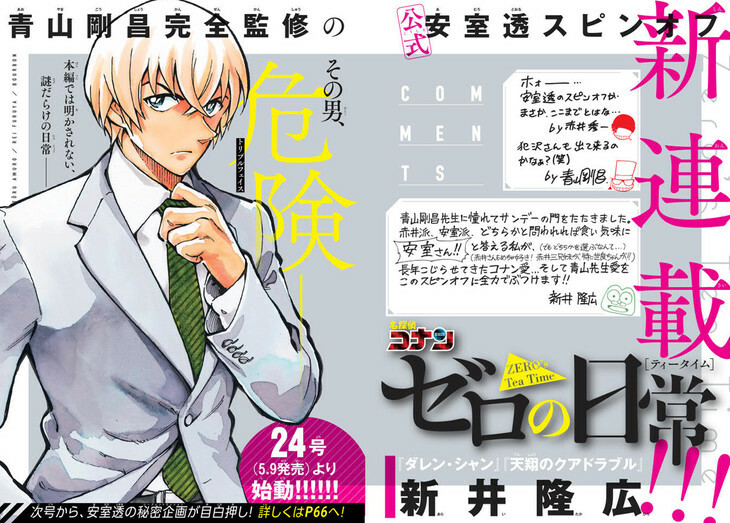 Detective Conan is getting a spinoff title starring Amuro Tohru, Mouri Kogoro's first apprentice. It will be titled Detective Conan: Zero's Tea Time (Meitantei Conan: Zero no Tea Time). Zero, as those caught up with Detective Conan will know, was Amuro's childhood nickname. The new series will be serialized in Weekly Shonen Sunday magazine beginning with its 24th issue dated May 9th. It will be drawn by Arai Takahiro, the artist behind Cirque du Freak, with Aoyama supervising. For the first ~800 episodes of Detective Conan. As an agent currently undercover in the Black Organization, there are tons of really interesting directions someone could take a spinoff starring Amuro. He was nicknamed Zero since his real name, Rei, sounds like a Japanese word for zero. If they're using that name for the series title, there is almost no way this is just going to be a "daily life of a Cafe Poirot waiter" story.